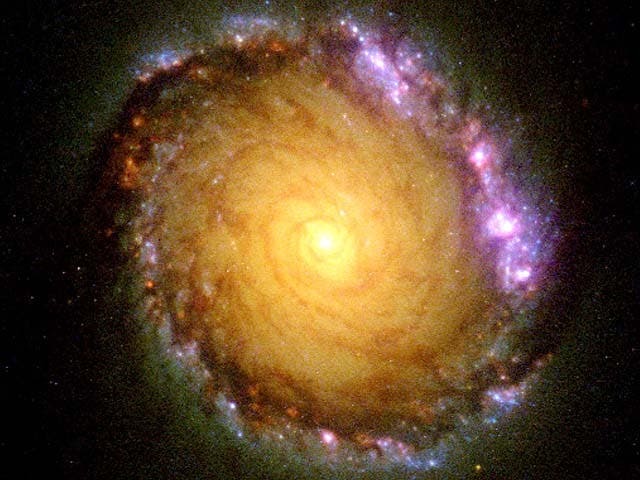 A team of Australian and Spanish astronomers have caught greedy galaxy NGC 1512, a spectacular barred spiral galaxy, gobbling on its neighbors and leaving crumbs of evidence about its dietary past. Galaxies grow by churning loose gas from their surroundings into new stars, or by swallowing neighbouring galaxies whole. However, they normally leave very few traces of their cannibalistic habits. 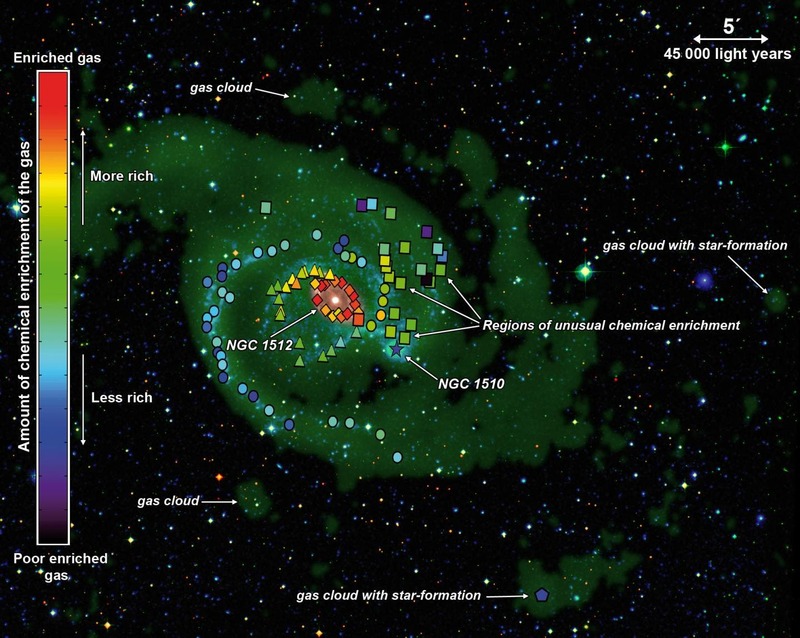 "We were expecting to find fresh gas or gas enriched at the same level as that of the galaxy being consumed, but were surprised to find the gases were actually the remnants of galaxies swallowed earlier," Dr López-Sánchez said. "The diffuse gas in the outer regions of NGC 1512 is not the pristine gas created in the Big Bang but is gas that has already been processed by previous generations of stars." The stunning 2,400 light-year-wide ring of infant star clusters surrounding the core of NGC 1512 are quite common in the Universe. In barred spiral galaxies they may comprise the most numerous class of nearby starburst regions. The giant bar, which is too faint to be seen in this image, funnels the gas to the inner ring, where massive stars are formed within numerous star clusters. CSIRO's Australia Telescope Compact Array, a powerful 6-km diameter radio interferometer located in eastern Australia, was used to detect large amounts of cold hydrogen gas that extends way beyond the stellar disk of the spiral galaxy NGC 1512. "The dense pockets of hydrogen gas in the outer disk of NGC 1512 accurately pin-point regions of active star formation", said CSIRO's Dr Baerbel Koribalski, a member of the research collaboration. Dr Tobias Westmeier, from the International Centre for Radio Astronomy Research in Perth, said that while galaxy cannibalism has been known for many years, this is the first time that it has been observed in such fine detail. "By using observations from both ground and space based telescopes we were able to piece together a detailed history for this galaxy and better understand how interactions and mergers with other galaxies have affected its evolution and the rate at which it formed stars," he said. The team's successful and novel approach to investigating how galaxies grow is being used in a new program to further refine the best models of galaxy evolution. "The unique combination of these data provide a very powerful tool to disentangle the nature and evolution of galaxies," said Dr López-Sánchez. "We will observe several more galaxies using the same proven techniques to improve our understanding of the past behaviour of galaxies in the local Universe."